Kazaa and LimeWire Companion is a lyrics finder and download accelerator for Kazaa and LimeWire. It allows you retrieve lyrics at the same time when you are downloading MP3 files from the FastTrack and Gnutella networks. It also accept manual query for your desired song lyrics. Kazaa and LimeWire Companion is equipped with download accelerator that speed up media file download from P2P network. Version 2.02 fixed a bug to handle old version of Kazaa. It allows you retrieve lyrics at the same time when you are downloading MP3 files from the FastTrack and Gnutella networks. It also accept manual query for your desired song lyrics. Kazaa and LimeWire Companion is equipped with download accelerator that speed up media file download from P2P network. Version 2.02 fixed a bug to handle old version of Kazaa. 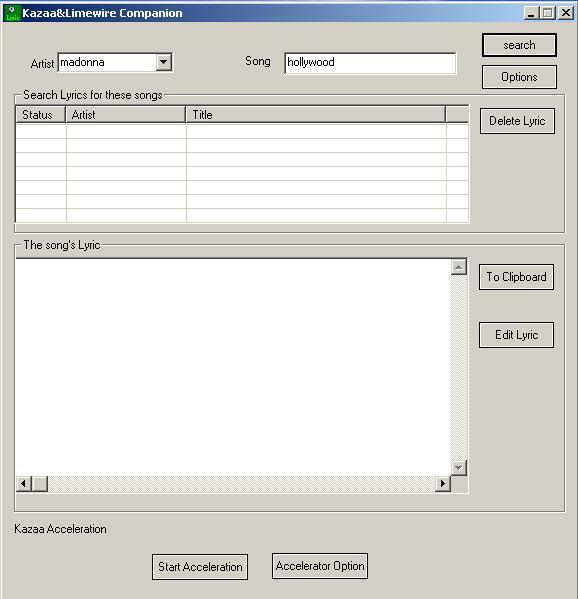 Kazaa and LimeWire Companion is a lyrics finder and download accelerator for Kazaa and LimeWire which allows you retrieve lyrics at the same time when you are downloading MP3 files from the FastTrack and Gnutella networks.